At first I thought the birds in the trees at the Foxconn’s largest plant in Shenzhen, China were fake. They sang so sweetly that I was sure my hosts had planted speakers for my benefit – a sort of Potemkin aviary high in the branches. The plant, called Foxconn City, is one of Foxconn’s 26 major and minor factories around the world. Built by founder Terry Guo in 1974, the City was the first of the many sprawling Foxconn complexes and covers three square kilometers. It is home to over 400,000 workers, many of whom live in university-style dorms on the Foxconn campus. It is reported to be China’s largest private employer and holds a place in the Western mind as the home to a new form of economic slavery, an eternal boogeyman that haunts the fever dreams of anti-techophiles. It’s also a place where thousands of young employees – some completing their degrees while they work through school, others simply trying to escape the grinding poverty of their home districts, and still others hoping for a leg up in China’s wild economy – come to assemble the items that surround us. Here they make our PCs, our MP3 players, our routers. Here they make our laptops, our cellphones, and our cameras. In the past year, only one other journalist has been allowed past Foxconn’s gates to see the factory, which is why I thought they had brought the birds (or at least fake Bose birds) out for my benefit. What better allegory for the doings of a secretive, destructive force for evil than fake birds in fake trees? “Are those real,” I asked my guide, a PR representative from Burson-Marsteller hired to smooth over Foxconn’s image in the West. “Those birds, are they real?” The moment I said it I noticed one flit from one branch to another. They were real. Having established that there was no ruse, no trickery, I began to see Foxconn City for what it really was: a place that made things. It was, by any standard, amazingly large. Wide avenues ran the length and breadth of the factory and along the main thoroughfare leading to the gate was a sort of Foxconn strip mall complete with stores selling food and sundries. There were two electronics stores on the strip, one modelled on their Ten Thousand Galloping Horses plan, a sort of Mom-and-Pop mail-order store familiar from the days of Sears catalog stores and another, larger IT Mall-style store that sells electronics and household goods. At a crossroads there is a red marble fountain set into the concrete. It is topped by a spinning marble sphere – about a meter around – that spins freely thanks to a flow of water that is two tenths of a millimetre thick. This main drag, a sort of meeting place/cafe/Main Street would be familiar to anyone who has gone to a college in the US. The streets – and the paths between buildings – are lined with lush trees and there are dark green lawns with little signs warning away errant feet. All over the plant young people walk from building to building. They wear sweaters and jeans even in the near tropical heat. It’s cold on the plant floor, kept cool to protect workers and the items they’re assembling. They walk nonchalantly even as cars roll through their midst. This is their turf. We began at the employee assistance center. In this building, below the employee lounge, there is a large waiting room where a few employees doze quietly. There is a bank of receptionists here, and they check people in for help. There are eighteen counselors on-site who are trained to assist in psychological counseling. What kind of help is available? This office offiers a hotline for employees to report problems and chat about personal concerns. It also offers counseling in private sessions with trained mental health specialists. It is available to all employees and, although the phone bank looked lively when I was visiting, the waiting room was empty. “This is for employees who are unhappy at home or have problems with their relationships,” said our guide. 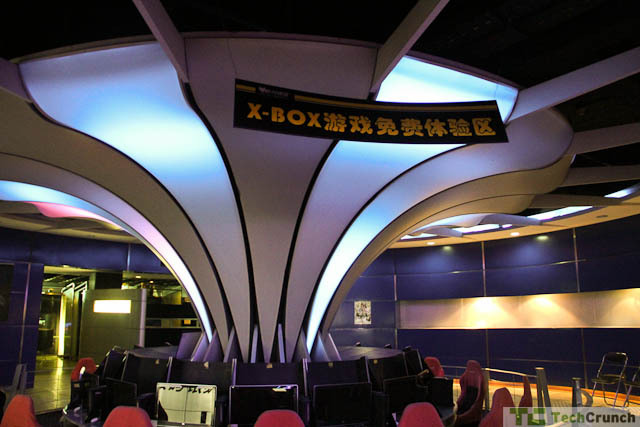 In 2002 Foxconn opened cybercafes for their workers – large, open rooms full of computers and lounge chairs as well as private rooms for couples and folks who want to phone home in a quiet environment. They play movies here and employees can read or nap or, as evidenced by most of the occupied screens, play video games and watch TV. The dorms had rooms for four men or women each, with a small, closed balcony for smoking. Shoes were piled up in the bars of the balcony and one nice selection of books – management, calculus, university-level english and economics – lining their small shelves. It was a college dorm room minus the fun. There were no Mountain Dew can pyramids, just the bare necessities and a few comforts. Since the rash of suicides at Foxconn plants two years ago, the company is changing its paternalistic attitude towards its workers and offering assistance rather than mandates. For more than a decade most of the workers here ate, slept, and socialized on campus. They did not leave – not because they were kept here, but because the surrounding area was fairly drab and the ride into Shenzhen proper after a long day of work was daunting. Instead, Foxconn became their lives. “The first change at the factory came after an employee survey that found many of the young people value a sense of freedom,” said Louis Woo, special assistant to the chairman and head of Foxconn’s burgeoning retail operations. Woo is a Stanford grad with a degree in industrial engineering and a PhD in economics. He has been tasked by the CEO to speak to foreign press, a job that he does not relish but does with aplomb. The neighborhood around Foxconn City is now growing. Small restaurants have popped up and there are large apartment buildings going up to house the workers. There are places to go now, and things folks can do on their off time. There is a pool below the dorms although I learned that it wasn’t very popular, even on weekends. 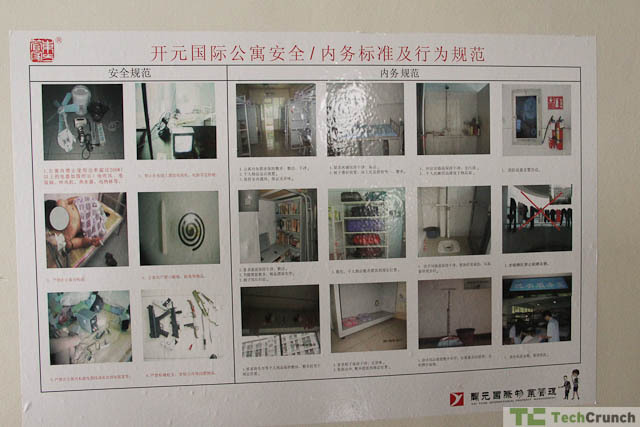 I only saw a few night shift employees wandering the dorm halls and rec centers of Foxconn. Most were sleeping during the day, getting ready to head into the factories at night. It is a bleak existence, to be sure, but for many it’s a living. 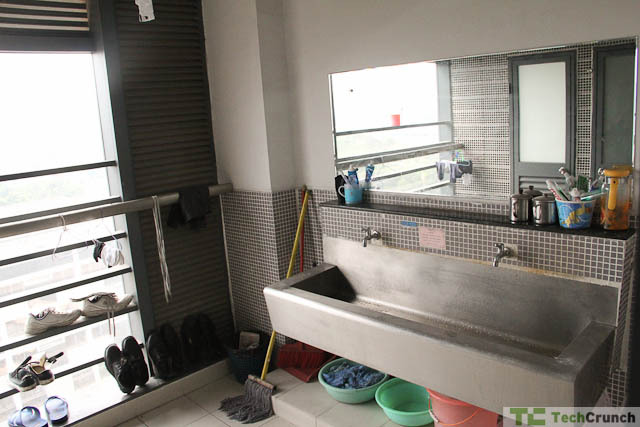 In order to assuage the drudgery, the company has given the the workers – who now make about 1300 yuan or $240 a month – a small stipend to live off campus. “Young candidates want to mix, they want to mix with other people, they want to be part of the community, they don’t want to be stuck on campus,” he said. Although we will talk about the problems at the factory later this week, something struck me as I wandered through this factory: it is, in short, just like every factory I’ve visited. The problems associated with Chinese manufacturing, the horror stories, the sad-eyed workers depressed by the monotony of the job were no where to be seen – and I looked, at least in the day I spent on site – and to say that this is a bad place to work is to be naive about the truths of modern manufacturing. Then there were the 2010 suicides. Fourteen high-profile suicides in the space of a year turned all eyes to the company. 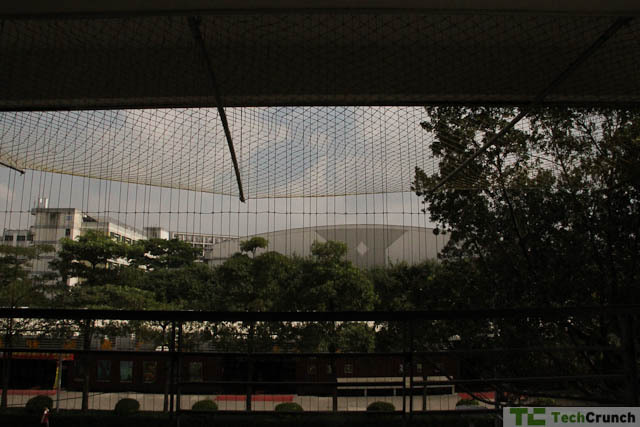 Their reaction was threefold: the installation of the “suicide nets,” a request to sign a “no suicide” pledge, and a slight raise from about 940 yuan. There have been no further publicized attempts in the past year, a fact that I’m sure makes Foxconn management sigh in relief. Slowly, the company is digging out from this PR nightmare and their reactions to the tragedy are now muted and respectful. It rings as unalloyed munificence—until a man puts his foot on the edge of a roof, looks across the campus full of trees and swimming pools and coffee shops, and steps off into nothing. If Foxconn has been anything in the past half-decade it’s reactive. For decades the company could depend on a workforce that was provincial and willing to work in a paternalistic environment of long hours, free housing, and three squares a day. However, the globalization of entertainment and what amounts to a booming economy in China has made the Chinese worker considerably more mobile – although not by Western standards. There is always another factory looking for workers and the cybercafe and the kitchens and the handsome campus is more an inducement to stay put. I’ve visited factories that I wouldn’t wish on my worst enemy. In comparison, this is an office park in Virginia, manicured, full of people toiling away towards a common goal. This is the first part of a series of four articles I’ll write about Foxconn and its place in history. Manufacturing’s long evolution from piecework to the assembly line, from the ateliers of the great watch and furniture makers to the grime and guff of the Industrial Revolution, from the agrarian to the cosmopolitan, is writ large in China. One expat remembers a time when the worst employees were sent outside of the factory wearing an embarrassing sign when he or she ruined a product. If Foxconn tried that today, a thousand cellphone cameras would wing the shots across the world in minutes. The eyes of the world are on Foxconn, and it is evolving. To state the obvious, the world isn’t fair. Factories like Foxconn City shouldn’t exist. There should be no reason employees should stand for ten hours a day, six days a week, to manufacture an iPad. But, in fairness, Foxconn sees its own place in the world changing as we speak. I’ll address these changes my final piece, but it is clear that the company doesn’t expect to be in the manufacturing business forever nor does it expect its employees to always stay on the line. The truth is that the sunset of the human worker is upon us and as Foxconn and other factories begin replacing their employees with robots, the societal changes that will take place could be striking. When I was a kid my dad worked in logistics for the Department of Defense. We would go to visit him on the base in Columbus and he’d show us the warehouses where veterans and civilians would mingle with the military employees, pulling and shipping parts to bases around the world. Over the course of his career he went from pushing papers to tapping on a green screen terminal to logging into a logistics system so rich and so complex that it took teams of IT staff just to maintain it. The pick and ship methods were slowly dying, replaced by automated systems. His warehouse in 1979 was as different from a modern shipping facility like Amazon as the mechanical calculator manufacturers of turn-of-the-century England are to Foxconn. Foxconn has a place in the economic conversation. Not because it is a huge employer and not because it abuses its power. It has a place because it showed us the future of manufacturing and arguably improved the lives of hundreds of thousands of employees over they years. It provides goods at a low price to a hungry group of neophiles who jump into line whenever the latest gadget is announced. It redefined desire by making everything accessible. This green, tree-lined campus hides little. Manufacturing is just that – the methodical assembly of items for shipment to sales points around the world. There is nothing glamorous in it and many cultures, our own included, understood that and the resulting backlash pushed the process from our shores to other shores. Foxconn is the apex of that movement. The company takes some of the best minds in China and assesses what can be done to make workers more efficient. Once it was the offer of free housing and a captive workforce. Now it is the promise of entrepreneurship, education, and meals off-campus. China is changing and Foxconn is changing. Where things go next – whether towards a rich, vibrant middle class or back into the dark ages – has a lot to do with how Foxconn and other factories like it weather the changes that are coming. Foxconn is now becoming proactive. Looking beyond its lucrative contracts it sees a future past manufacturing and in distribution. Unlike Taiwan’s HTC, Foxconn doesn’t want to be a brand. They want to be a sales channel, grabbing some of the revenue that will surely flow from the Chinese middle class in the near future. Until then, however, there is Foxconn City where men and women make the things we covet. There are no Wonka-esque secrets here, no fake birds, no smiling shills put up for my edification. This is just the 21st century, its seconds stamped out in a massive factory one transistor at a time. This is part one of a four part series that will run this week about Foxconn. You can read the whole series here.